When I was a beginner I wasn't very quality conscious. I just flicked through the cheap electric guitar packages in the Argos catalogue and went with the "black one that looks like a Strat". Now, putting this page together, it's evident that with a little more attention to detail I'd have picked a guitar I could have modded/tweaked and still be playing to this day (or at least sold for more than half a bottle of whiskey) and an amp that would still be gracing my bedroom practice sessions. Squier have several entry level offerings, but by far the most highly rated, in terms of value for money, is the SE Special with SP-10 amp. 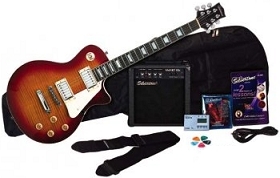 A comprehensive bundle including guitar, amp, tuner, strap, guitar stand and learning materials. Even those who wouldn't class themselves as absolute beginners describe this package as a solid practice rig. A great purchase for beginners looking for the "whole package", to get started right away. The SE pack has exceeded many users' expectations in both the playability and reliability of the guitar and the quality of the amp. The extras are a bonus and you get more in the Squier packs than most. More experienced players note that the SE Special guitar is set up well, with clean fretwork and low actions attainable without fret buzz - tools are included to adjust the string height. Unlike many cheap guitars, the tuning on the Special is stable and remains in tune even after several deep plunges on the whammy bar. 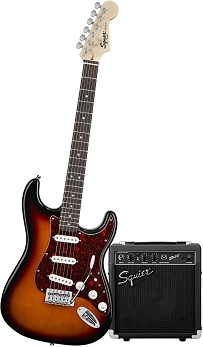 Users comment that the Strat is easy to play which is especially good for beginners who are still developing their finger dexterity and strength. I remember the first electric I got just made practicing ten times harder - I wish this pack was around when I started! The SP-10 amp does a fine job - nothing special but more than enough power for those quiet bedroom sessions and the overdrive channel allows you develop your lead and general rock playing. Overall, people are very happy with their purchase and, browsing some of the forums, many more experienced players are using the SE Special either as a backup or a reliable base for modding and upgrading - so it's future proof as well. Silvertone aren't as well known as Fender/Squier or Gibson/Epiphone, but they deserve to be. If you want the deep, rich tones and sophisticated arched quilt associated with so many legendary guitarists, with a decent practice amp, the SSL3 package is sure to impress. Let's begin with the SSL3 guitar, because people are positively raving about it. The build is solid as a brick s**t house. In fact, one of its truly defining features is that it will easily withstand thousands of playing hours and any knocks and bumps that "nature" should inflict upon it. It's almost like Silvertone have made this especially for the more careless and/or aggressive player. Saying that, you won't exactly want to throw it around, as it sounds so beautiful for a $200 guitar (which is its going rate as a stand alone purchase). The stock humbuckers deliver a sweet, warm tone that, admittingly, may not be fully expressed through the Smart III 10 watt amp, but as mentioned above, treat it as an investment and you'll be plugging it into a more gig worthy amp sooner than you think. The set neck and tune-o-matic stop tailpiece gives it that little extra sustain. If some years down the line you become more discerning about tone, this is the perfect project guitar to work on. No need to dream about saving up for that entry level Gibson LP, you have a solid base axe for future upgrades. That's why this is such a good package - it delivers now and for the forseeable future. To be honest, the other bits and bobs you get are just standard, and with the amp, as part of that extra $50 you pay on top of the guitar itself, unbelievable value. Don't settle for less. Best For Guitarists who want a slim, Strat style guitar. Guitarists who want a chunkier, Les Paul style guitar. Defining Features Classic Strat features with 3 pickups. Fast, C shape neck. Pack includes stand. Classic Les Paul features. Impeccable fit & finish. Set neck for increased sustain. Amp 10 Watts. 2 channels. 2-band EQ. Headphone socket. 10 Watts. 2 channels. 2-band EQ. Headphone & Line in sockets.